For roughly the first 75 minutes of Escape Room, I thought I had uncovered the rarest of rare finds: a good January movie. Alas, the film isn't able to stick the landing. During the final half hour, everything that's compelling about this low-budget thriller collapses in a miasma of idiocy. Hopes and expectations that it might do something - anything - surprising or interesting are crushed as it opts for a by-the-numbers approach to reducing the cast of characters one-by-one. It's the old slasher-movie game of "guess the order in which the people die" reimagined for a PG-13 audience (in other words, no gore). To add insult to injury, Escape Room doesn't really end; it stops and dangles the promise of more to come. The credits might as well have closed with the following caption: "If you want to see what happens next, tell all your friends to buy tickets. That way, this movie will make money and there will be a sequel." In recent years, escape rooms have become popular party activities. A group of people are locked in a room where they must solve puzzles and discover clues that will allow them to find a way out. There's a time-limit (usually one hour) and a gamemaster who can offer clues along the way. For more complicated (and expensive) escape rooms, there are multiple levels that have to be completed in order to reach the final exit. This real-life phenomenon provides the jumping-off point for Adam Robitel's film. The screenplay, co-credited to Bragi Schut and Maria Melnik, introduces six generic characters whose key characteristics and sketchy backstories are sufficiently populated for viewers to recognize their strengths and weaknesses. The putative lead is college freshman Zoey (Taylor Russell), an incredibly smart but socially withdrawn physics major who is told by a professor to "do something that scares you" over Thanksgiving break. She finds a puzzle box at her doorstep and, after solving it, secures an invitation to an exclusive escape room event. She is joined by Jason (Jay Ellis), a type-A stockbroker; Ben (Logan Miller), a stock room clerk; Amanda (Deborah Ann Woll), an army vet suffering from PTSD; Mike (Tyler Labine), a truck driver; and Danny (Nik Dodani), an escape room addict. The prize for winning is $10,000 and bragging rights. Before the contestants realize it, they're playing and it soon becomes clear that death is a consequence of bad decisions and there's no way out except to finish the game, which is probably rigged. For most of the setup and the early stages of the challenge, Escape Room moves briskly, sustaining tension and building a sense of mystery about what is really going on. For a while, I thought Robitel (whose most recent directorial effort was the Insidious spin-off, The Last Key) intended to take the movie along a trajectory similar to those in thrillers like Sleuth or David Fincher's The Game, where reality becomes a parlor trick and things are rarely what they seem. Unfortunately, when the curtain is pulled back for the big reveal, Oz fails to impress. The movie falls apart once its essential "truth" is uncovered; it turns into just another body-count movie. Worse still, the cliffhanger ending demands a sequel - by no means a certainty - in order to resolve a variety of dangling plot elements. Escape Room isn't a product of Blumhouse but it has a lot in common with those small, usually profitable horror films - low budget, a no-name cast, and a story that knows its audience and aims to please. The last characteristic represents the movie's downfall because, by failing to take chances, it wastes a strong beginning, likable (if not necessarily well-developed) protagonists, and a potentially twisty scenario. Ultimately, the calendar doesn't lie. 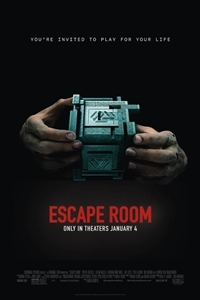 If Escape Room had been viewed as a hot commodity, it would have been released at some other time rather than the first Friday after New Year's Day. The movie may attract some attention from horror/thriller fans eager for a post-Halloween fix but this is no better than a direct-to-video production masquerading as a theatrical release.